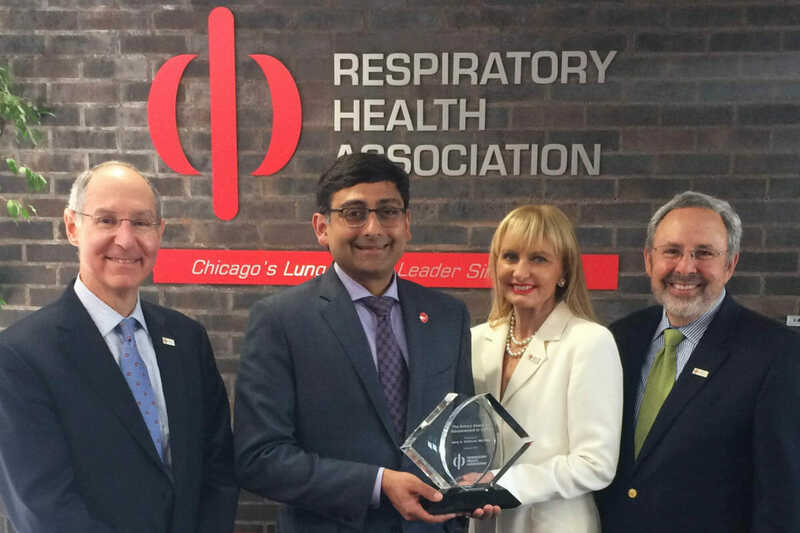 RHA was pleased to name Dr. Jerry Krishnan, Professor and Associate Vice Chancellor for Population Health Sciences at University of Illinois at Chicago, as recipient of the 2017 Solovy Award for Advancement in COPD. Dr. Krishnan has accomplished a significant body of COPD research over a relatively short career and stands out as a national leader in COPD research. He conducts national and local studies to identify care strategies that will help people living with COPD. With a commitment to building partnerships and developing large-scale research networks to establish better treatment options for the COPD community, Dr. Krishnan has had a significant impact on clinical practice. As an advocate, Dr. Krishnan has made great strides in improving the health outcomes for individuals living with COPD. Jerold Solovy, former chair emeritus of the Jenner & Block law firm in Chicago, was one of the estimated 1 million individuals in Illinois living with COPD. Kathleen Hart Solovy established the fund in his memory, after experiencing firsthand the toll that COPD has on individuals and their families. Through the endowment, RHA will make an annual award to an outstanding COPD researcher. © 2019 Respiratory Health Association. All Rights Reserved.